Yep. 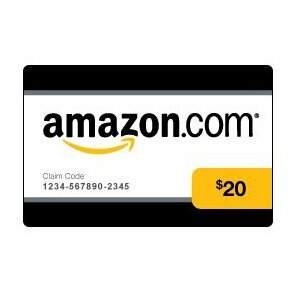 You read correctly, I am currently doing my happy dance (no pictures, please) because I just got another $20 Amazon gift code from Valued Opinions survey company. It seems most of the surveys I take for them are between $2 – $5 each and it has only taken me a few weeks of actually taking the surveys to earn the $20 payout. I’m so happy, now I’m singing in my head. I won’t make you listen. I probably qualify for about 80% of the surveys they send me and, to be honest, I don’t do all the surveys they send me because surveys seem to take up a lot of time. I will say that I’m happy when I do put in the time with the surveys because I’m saving up all my Amazon codes for a Kindle Fire. Yippee! Oh, and the best part, I submitted my request to cash out about 3 minutes ago and I’ve already entered my code into Amazon. I could go buy something on Amazon now if I wanted to, but I will be patient and wait until I have enough for my Kindle Fire. Let’s hope it doesn’t take too long. If you want to join me on Valued Opinions I can email you a link. Unfortunately, I haven’t figured out on their site how to add a link to my page. Just know I LOVE THEM! Great blog! I’m following you from the Hop Along Friday hop. I hope you will stop by Swanky Baby and follow us too! Have a good day! Thanks for stopping by – I’m following you back. Have a great weekend! Jenn – I just sent the invite! Hope you have as much success as I’ve had with it. Let me know. Thanks!